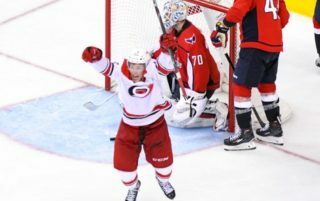 Through the first eight games of the season, the Storm hadn’t managed a shorthanded goal. 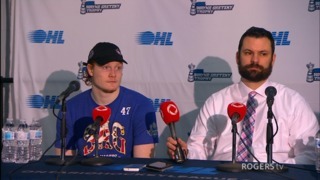 Last year’s leading scorer Zack Mitchell picked the perfect time to change that with a highlight reel goal to force overtime against the visiting Peterborough Petes. Mitchell’s fifth of the season and second of the game with 2:23 left in regulation evened the score at six and forced overtime to set up captain Matt Finn’s heroics in extra time. The Petes scored first when former Guelph forward Frank Menard caught Garret Sparks cheating to his glove side and snapped his sixth of the year short side for the first of three straight powerplay goals for the visitors. Matt Finn tied the score with the man advantage before Menard and Zach Lorentz put Peterborough on top 3-1 with 4:05 to play in the frame. Before the buzzer sounded to end the first, the Storm replied with singles by Justin Auger and Scott Kosmachuk to make it 3-3 after a frantic opening twenty. After a six goal first, it was more of the same in the second as the clubs combined for five with the Storm coming out on the short end of a 6-5 score. Patrick Watling with his third gave Guelph their first lead of the afternoon, but a pair of Petes’ tallies restored their edge and spelled the end of Garret Sparks’ day in goal. 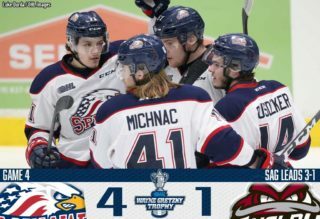 Jason DaSilva replaced the Storm’s number one 3:14 into the second to make his OHL debut and the rookie netminder was solid the rest of the way to earn the win. Mitchell knotted the score at five 82 seconds after DaSilva entered the game but Stephen Nosad made it 6-5 with a late marker. Outshooting the Petes 40-25 through two, the Storm could only muster three shots for much of the third and their comeback chances looked bleak when Tyler Bertuzzi was whistled for charging with 3:12 to play. Instead Mitchell outraced Petes’ star defender Slater Koekkoek for a loose puck and despite being hauled down, he managed to lift the equalizer over Michael Giugovaz. The Petes pressed late for the game winner with a pair of Guelph players in the box and came close on a hard shot that hit post and then crossbar but stayed out. 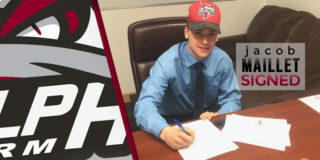 In the overtime session, the Petes had the early pressure but the Storm countered and eventually Zac Leslie set up Finn for a one timer from just inside the blueline that hit mesh and electrified the crowd of 3,777. This afternoon’s win makes it six games without a regulation loss for Guelph and improves their record to 6-2-0-1. 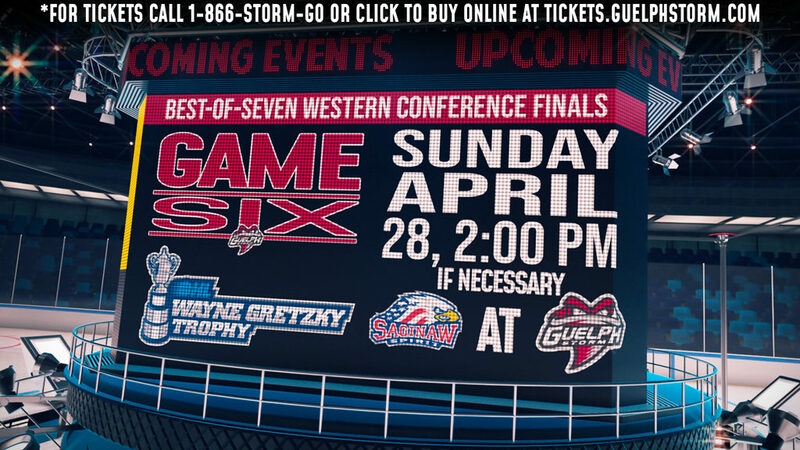 The Storm will be out of action until next Friday night when the Sarnia Sting visit the Sleeman Centre for a 7:30 start. 1st Period-1, Peterborough, Menard 6 (Trojanovic, Lorentz), 5:01 (PP). 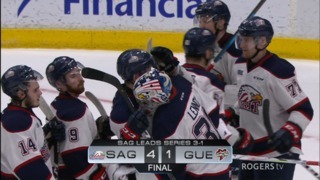 2, Guelph, Finn 2 (Leslie, Dickinson), 9:36 (PP). 3, Peterborough, Menard 7 (Trojanovic, Koekkoek), 10:45 (PP). 4, Peterborough, Lorentz 3 (Trojanovic, Findlay), 15:05 (PP). 5, Guelph, Auger 5 (Leslie, Milne), 16:07. 6, Guelph, Kosmachuk 7 (Fabbri, Mitchell), 18:58 (PP). Penalties-Lorentz Pbo (hooking), 0:44; McGinn Gue (interference), 4:32; Findlay Pbo (cross checking), 8:14; Mitchell Gue (roughing), 10:23; Finn Gue (high sticking), 14:10; Tanus Pbo (elbowing), 16:58; Ceresnak Pbo (check from behind), 18:38. 2nd Period-7, Guelph, Watling 3 (Auger, Horvat), 1:35. 8, Peterborough, Cornel 2 (Maguire, Hietkamp), 2:11. 9, Peterborough, Betzold 1 (Varga), 3:14. 10, Guelph, Mitchell 4 (Finn, Kosmachuk), 4:36 (PP). 11, Peterborough, Nosad 2 (Ceresnak, Tanus), 15:50. Penalties-Pierog Pbo (misc-usc), 1:30; Bertuzzi Gue (misc-usc), 1:30; Trojanovic Pbo (holding), 4:11; Cornel Pbo (interference), 5:35; served by Garlent Gue (too many men), 6:53; Murphy Pbo (instigator, fighting, misc-instigating), 9:09; Garlent Gue (fight-inst. upon), 9:09; Mathers Pbo (cross checking), 11:08; Bertuzzi Gue (interference), 19:42. 3rd Period-12, Guelph, Mitchell 5 (Leslie, Kosmachuk), 17:37 (SH). Penalties-Horvat Gue (delay of game), 0:58; Trojanovic Pbo (holding), 10:51; McGinn Gue (high sticking), 12:50; Bertuzzi Gue (charging), 16:48; Leslie Gue (cross checking), 17:53. Shots on Goal-Peterborough 13-12-14-0-39. Guelph 22-18-4-1-45. Power Play Opportunities-Peterborough 3 / 9; Guelph 3 / 9. Goalies-Peterborough, Giugovaz 2-2-2-0 (45 shots-38 saves). Guelph, Sparks 5-2-0-1 (16 shots-11 saves); DaSilva 1-0-0-0 (23 shots-22 saves). Referees-David Gauthier (28), T.J. Foster (29). Linesmen-Jordan Browne (93), Dave Pfohl (96).